i just can't tell you how excited i am to be finally represented by a gallery. many artists feel this is a rite of passage. i've worked hard for this accomplishment - it took many years of promoting myself, developing my craft, and bouncing back after many bouts of doubt, discouraged that my 'gallery dream' was nothing but a fantasy. sure, it's not an end all, but it sure feels good to be included in a family, of sorts. the forward thinking vision, non-pretentious attitude, and uncompromising talent from all levels of this gallery made it well worth the wait. 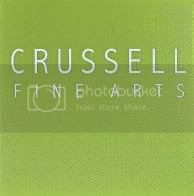 crussell fine arts is a different breed of gallery altogether. and that's precisely why i like it. they represent artists, they lease and sell art, hold regular exhibitions (both juried and non, local and national), as well as host regular life drawing sessions throughout the year. and that's just the tip of the iceberg. jeffrey crussell, the executive director, even accepts submissions. so, GET ON iT PEOPLE!!!!! whether you're local or non, he'll consider it all. i'll be featured as the 'july' artist, and although i haven't been 'unveiled' yet on the website, i'll give ya a sneak peek. hee heeeeee.....shhhhh, don't tell anyone. and thanks for the heads-up, i've bookmarked it for submitting something sometime. oh, i hope you do....chances like this don't come around too often in this snooty town.